Violinist Randall Goosby, 21 of the U.S.
Pianist Maxim Lando, 15 of the U.S.
Cellist Jonathan Swensen, 21 of Denmark/U.S. 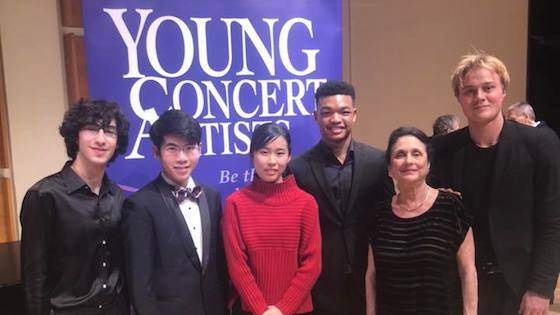 2018 Young Concert Artists First Prize Winners, L-R: Maxim Lando; Aristo Sham; Risa Hokamura; Randall Goosby; Jonathan Swensen. The five young musicians will join the roster of Young Concert Artists, which provides management services, publicity, career guidance and concert engagements, including debuts in New York and at the Kennedy Center in Washington. Young Concert Artists is a non-profit organization founded by Susan Wadsworth in 1961, dedicated to discovering and launching the careers of exceptional, but unknown, young musicians from all over the world. YCA gives no rankings, and any number of winners can be selected – with each candidate competing against a standard of excellence, not each other. The jury for this year's final round included chairman Susan Wadsworth; plus musicians (many of them YCA alumni) Peggy Bouveret, Randall Scarlata, Koichiro Harada, Chee-Yun, Jerome Lowenthal, Ilana Vered, Scott Nickrenz, Fred Sherry and Gerard Schwarz. November 15, 2018 at 12:31 PM · Anyone wanting a definition of a "concert" violinist need look no further.